The use of advanced methods to solve practical and industrially relevant problems by computers has a long history. Symbolic Computation is concerned with the algorithmic determination of exact solutions to complex mathematical problems; and more recent developments in the area of Satisfiability Checking are starting to tackle similar problems but with different algorithmic and technological solutions. AWARD will focus on improving the current state of operations inside a warehouse. The article "Is There Light at the Ends of the Tunnel? Wireless Sensor Networks for Adaptive Lighting in Road Tunnels" written by Amy Murphy and Matteo Ceriotti, in collaboration with DISI, Create-Net, and Siemens, was awarded the Best Paper Award at the IPSN 2011 conference, a flagship venue in the field of Wireless Sensor Networks. 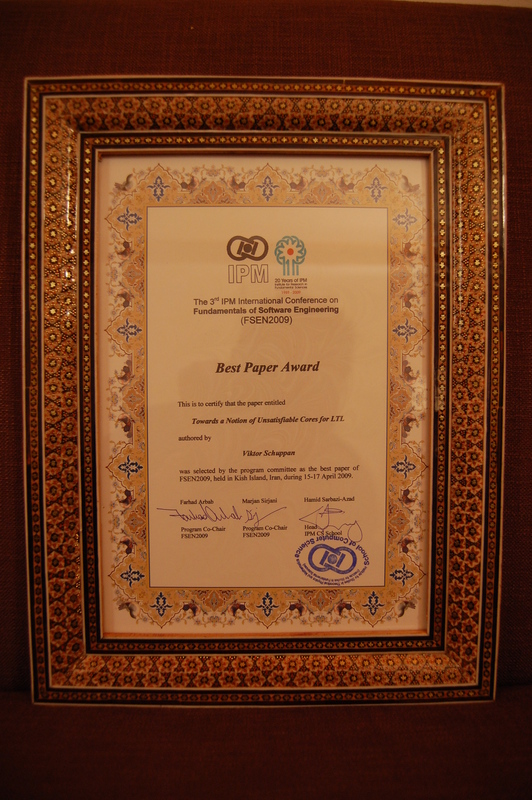 Viktor Shuppan won the best paper award for his paper on unsatisfiable cores at FSEN'09. Official birth date of the Embedded Systems Research Unit. Alessandro Cimatti, Iman Narasamdya and Marco Roveri were awarded the EASST Best Paper Award for the paper "Boosting Lazy Abstraction for SystemC with Partial Order Reduction" at the TACAS 2011 conference.